Long Island City's Queensbridge Houses, the largest public housing complex in the country. 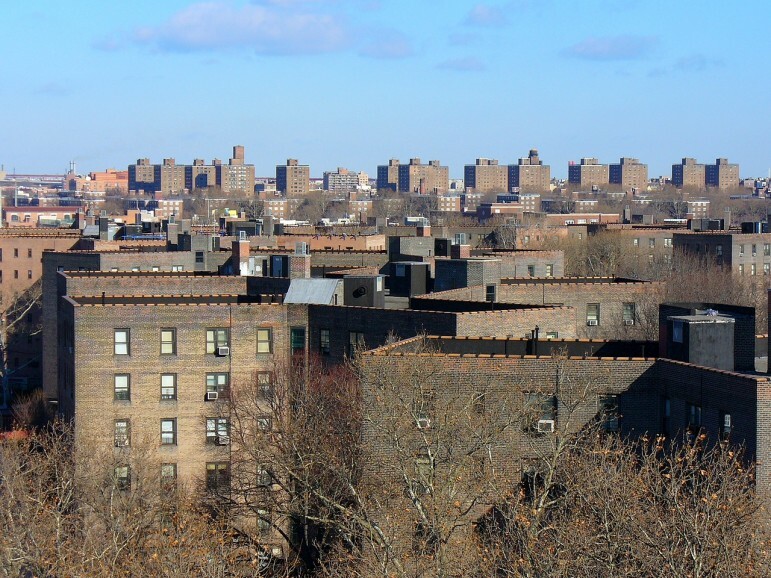 The Trump administration’s FY 2019 budget once again includes unprecedented cuts to the nation’s housing programs that could have a drastic impact on New York’s affordability crisis and public housing stock if approved, housing advocates say. While they would impact tenants across the nation, the cuts would have a particularly harsh impact in New York, which would suffer from the second highest number of lost Housing Choice Vouchers after California, and by far the largest cut in public housing funding. Analysts say the FY 2019 budget is not likely to pass through Congress, which has already rejected Trump’s austere 2018 budget, but it is certainly changing what is considered an acceptable ask and is indication of the administration’s ongoing priorities. Congress has not yet passed a 2018 budget, but has agreed to raise caps on spending and is expected to negotiate a final budget over the next weeks. The mayor’s preliminary budget for HPD does not assume that Trump’s drastic reductions would take place and roughly assumes status quo funding levels, HPD confirmed. The administration’s attitude is that it should not concede to the cuts by assuming them in city budgets. NYCHA, which forms its budget separately from the city, also does not predict Trump’s proposed cuts will in fact pass. Advocates for their part, are condemning the proposed federal disinvestment while also calling on the state and city to assume greater responsibility—given that even if current levels of funding are maintained, that will be far below what the state’s housing programs need, they say. “It’s clear that Trump is abandoning public housing and that is after an 80-year history of federal involvement, federal initiative and support for public housing…it’s an outrage to federal housing policy,” says Victor Bach of the Community Service Society. He adds, however, that while in most states Washington is the sole creator of public housing, in New York and a few other states, the state and local governments have also financed the creation of public housing inventory—as well as disinvested from that inventory. That means there’s a “triple obligation” of state, local, and federal government to NYCHA, he says. The FY 2017 budget appropriated about $48 billion for HUD. Last year, the Trump administration proposed slashing that budget to about $40.7 billion for FY 2018. As earlier reported by City Limits, NYCHA projected that the proposed 2018 budget would result in a $220 million or 68 percent cut to NYCHA’s capital budget and an $80 to $130 million or 11 percent cut to its operating budget, as well as result in the loss of 13,000 housing vouchers. HPD, which is dependent on federal assistance to pay for roughly 86 percent of its expense budget, would also have been greatly impacted. The Trump administration had proposed eliminating the Community Development Block Grant program, which funds code enforcement, emergency shelter, emergency repairs, and housing litigation, among other city initiatives, as well as HOME, which funds down payment assistance, supportive housing, and rental assistance vouchers. Trump’s 2019 HUD budget was, on first draft, even more austere, proposing just $39.2 billion for HUD—$8.8 billion cut from enacted 2017 levels, of which about $1 billion would be lost by New York State. That budget was drafted shortly before Congress’s February 9 deal to raise spending caps on defense and non-defense funding by a total of $300 billion over two years, and revised thereafter with an addendum to appropriate some (but not all) of the new funds approved by Congress. HUD gets $41.24 billion in that updated version. In that revision, tenant rental assistance programs and project-based rental assistance do mildly better than in the FY 2018 proposed budget, as well as do housing programs for the elderly and people with disabilities. But public housing does worse: the administration would completely eliminate the public housing capital fund and provide decreased funding for operating costs. And once again, the budget proposes completely eliminating the Community Development Block grant program, HOME and the Housing Trust Fund, among other programs. “While the Budget seeks stable or increased funding for direct rental subsidies to the elderly and disabled, as well as to homeless assistance and lead hazard control, in other less targeted programs, the administration is committed to the idea that state and local governments are best positioned to address specific needs in their communities,” states a HUD press release. The budget also plans an expansion of the Rental Assistance Demonstration program—a sign that the Trump administration favors converting public housing to public-private ownership. It also includes proposed legislative changes to increase the rents paid by HUD-assisted tenants from 30 percent to 35 percent of their income and calculate this percentage not from their adjusted income, but from their gross income (with the exception of the elderly and people with disabilities) and set new minimum rent standards of $150 per month. The consequences for New York City would again be enormous. For NYCHA, the FY 2019 budget would result in a $330 to $466 million cut to the authority’s operating budget and a $346 million loss (estimated based on 2018 funding levels) in capital funds. This comes at a time when NYCHA’s updated capital backlog is expected to exceed $25 billion. The cuts could also result in the loss of 15,000 rental assistance vouchers citywide, HPD reports. Advocates are also protesting the administration’s proposal that would allow housing agencies to terminate assistance if a non-disabled tenant isn’t working 32 hours a week or participating in an education or training program. As pointed out by the Center, 74 percent of working-age non-disabled people using HUD rental assistance already do work or are subject to work requirements for another federal benefit, but such recipients sometimes work jobs with variable hours, which could make it difficult for them to meet the 32-hour work requirement. The good news is that New York is unlikely to see such drastic cuts. Congress is expected to spend the next few weeks negotiating a 2018 funding bill with the goal of approving something by March 23. Last year, the House and Senate each passed their own, divergent spending bills. For HUD, the House proposed keeping spending levels at 2017 levels of $48 billion, while the Senate called for a modest increase above 2017 levels to $49.9 billion. Even if something like the more generous Senate budget passed, housing advocates say that still wouldn’t be enough to address the growing costs of HUDs programs. For instance, according to the Center on Budget and Policy Priorities, the Senate’s bill would still result in a loss of 30,000 tenant vouchers due to factors like prior years of disinvestment in the program and rising rental costs. Analysts say that thanks to the February 9 deal and raising of the spending caps, there is now a potential for increased non-defense spending above the levels proposed in the Senate Bill, but it’s unclear to what extent HUD will get any additional funding. As the city implements a new, federally mandated system for referring applicants to supportive housing, some advocates believe more must be done to stop housing providers from ‘screening out’ the hardest tenants to serve. Much has been written about the proposal to triple minimum rents for the very lowest income households. That’s not even the worst of it.